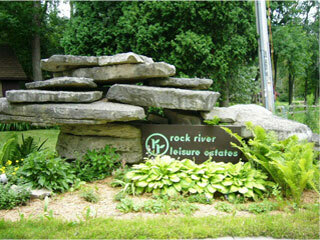 Rock River Leisure Estates provides a resort-like atmosphere where you can enjoy the great outdoors. We are a seasonal gated community with owned RV and Cottage lots. We are located along the Rock River at the base of Lake Koshkonong, the second largest natural lake in Wisconsin. You will no longer need to find a hook-up in a crowded campground. You can enjoy plenty of open space without being crowded. There is never a dull moment in the summer with water sports and fishing on the river and lake, two pools, tennis, volleyball, bocce ball, shuffleboard and horseshoes. Family activities include Karaoke, Movie Night, DJ Dances, Kids Olympics, and Kids Fishing Contest. And, for your convenience, there is a country store and laundry facilities. In the winter you can enjoy cross country and downhill skiing, snowmobiling and other winter sports available in the surrounding area. Rock River Leisure Estates will remain beautiful and undisturbed because you and your neighbors own the land. You are protected by zoning laws, recorded plots, deeds and title insurance. Owner’s association covenants and restrictions further assure you that the campground will always be your kind of place. Come visit, inspect our properties for sale and join our community.